This two-volume handbook offers a thorough treatment of the concepts and theoretical developments concerning how to apply cultural knowledge in theory and practice to various racial and cultural groups. PART I: TRAINING FOR RACIAL-CULTURAL COMPETENCE. 1. Racial-Cultural Competence: Awareness, Knowledge, and Skills (D. Sue). 3. Teaching Racial-Cultural Counseling Competence: A Racially Inclusive Model (R. Carter). 5. The Ecology of Life Spaces: Racial Identity-Based Education and Training (V. Wang). 6. A Practical Coping Skills Approach for Racial-Cultural Skills Acquisition (B. Wallace). 8. 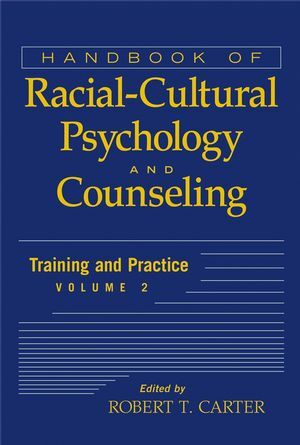 Racial-Cultural Training for Group Counseling and Psychotherapy (M. McRae & E. Short). 9. The Working Alliance, Therapy Ruptures and Impasses, and Counseling Competence: Implications for Counselor Training and Education (W. Liu & D. Pope-Davis). 10. Racial-Cultural Training for Supervisors: Goals, Foci, and Strategies (E. Chen). 11. Applications of Racial-Cultural Supervision (A. Reynolds). 12. Postdoctoral Training in Racial-Cultural Counseling Competence (C. Ridley & D. Mollen). PART II: CRITICAL ISSUES IN RACIAL-CULTURAL PRACTICE. 14. Integrating Theory and Practice: A Racial-Cultural Counseling Model (A. Alvarez & R. Piper). 16. The Impact of cultural Variables on Vocational Psychology: Examination of the Found and Bingham Culturally Appropriate Career Counseling Model (K. Ihle-Helledy, et al.). 17. Diagnosis in racial-Cultural Practice (T. Buckley & D. Franklin-Jackson). 18. Assessment Practices in Racial-Cultural Psychology (L. Suzuki, et al.). 19. Racial-Cultural Issue sin Clinical Assessment (C. Branch). 20. Racial-Cultural Practice: An Integrative Approach to White Racial Identity Assessment (T. Richardson & E. Frey). 22. Family Counseling and Psychotherapy in Racial-Cultural Psychology: Case Applications (A. Thomas). 23. 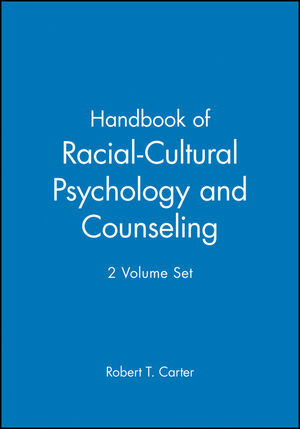 Couples Counseling and Psychotherapy in Racial-Cultural Psychology: Case Application (D. Miehls). 24. Immigration and Transition: Implications of Racial-Cultural Counseling and Clinical Practice (P. Arredondo). 27. Racial Discrimination and Race-Based Traumatic Stress: An Exploratory Investigation (R. Carter, et al.). 30. An Racial Code for Racial-Cultural Practice: Filling Gaps and Confronting Contradictions in Existing Ethical Guidelines (L. Cladwell & D. Tarver). 31. Racial-Cultural Training and Practice Moving form Rhetoric to reality: Summary and Conclusion (R. Carter, et al. ).